Becoming an outlier demands managing what we can and the three most important quantities are time, energy and meaning. Okay outliers, here is the deal. Whether outlier or outlier wannabe, we all have the same problem / opportunity. We get the sense that we live in a pretty vast, not very bounded world and therefore are faced with determining which part of infinity we want to harvest. We eventually come to know, that although we can accomplish many things, perhaps even an amazing number of things, that we can not do everything we can imagine doing. And, by the way if we could, than we would probably not be outliers, for our imaginations would not be that fertile. Exceptions to this occur, as some people are so excellently disciplined at self organization and prioritization, that they can convince themselves they are already doing everything they ever wanted, or imagined they might want to do. Just a guess, but I suspect that if they look at the world from the corner of their eye they will notice a few more things on the periphery trying to grab their attention. Okay as a potentially infinite being, in a potentially infinite universe, what is one to do on a day to day basis? Here is a suggestion of what to manage. What you say, there is nothing to manage, everything is hunky dory and working perfectly. Well, then you are an outlier among outliers, an uber outlier. But for those who are not here are a few thoughts. We only have the time, energy and will to manage a subset of what we can perceive. I suspect, even the most maniacal manipulators amongst us can not manipulate to the degree their insecurity drives them to. The disease of the manipulator and the bully, for they are one and the same, is of course insecurity, for those who feel good about themselves have no need to manipulate or to bully others. Back to the non-bullying outlier community still left reading, as by now all of the bullies and manipulators have likely stopped reading this. What, you say? How about those of us who try to manipulate or bully ourselves? After all isn’t the what managment is about anyway? Well, no it is not. In fact, I suspect that most bully and manipulators tend to try to use this same technique to manage themselves as well as others, which may be underlying the insecurity driving these behaviors … but on to more positive topics. If you want to do a lot in the world, you are going to have to put out a lot of effort, and if that effort is totally unmanaged, you are not likely to grab the brass ring, whatever that means to you . Which brings us to … we do not have enough time or energy to manage everything. What we can and should manage is a bit philosophical and meta so bear with me. We sometimes have the feeling, or are least told by others that Time Management is crucial for it is the only non-renewable finite quantity at our disposal. And yes, time management is clearly important, as how many of you outliers struggle with time management? Why is this so difficult? We do not in fact all have the same amount of time. We may all have 24 hours in a day but some of us are going to have a lot more days and years, than others. There are two enormous factors which influence the number of years we have, assuming no freak accident cut our lives short out of the blue. Two factors impacting the perception and application of time enormously, are energy and meaning, both which are very personal quantities. We do not all have the same amount of time, energy or meaning, yet all three of these are to a degree, manageable, extremely worth managing and interdependent. The amount of time you have, and how you use it, is directly influenced by the amount of energy you have, and the amount of meaning you have. If you are a top down thinker, a bottom up thinker, or both, these relationships get to the same place. You have to manage all three Time, Energy, and Meaning, which I am abbreviating as TEM. If you have all of the time and energy in the world, and no meaning, than life is not very worth living, at least for me it isn’t. If you have a ton of meaning but no time or energy to pursue what matters to you, than life may have meaning, but you will still be very frustrated. If you have boundless unfocused energy, and are constantly sprinting toward the next shinny object or idea, you will still be unfulfilled and never achieve your outlier potential. Therefore the three quantities TEM, all need to be managed jointly, as they mutually modulate each other all of the time, at every moment. Sometimes people are suffering so much that they may confuse coping with meaning. Coping is not the same thing as living life fully. Sometimes when times are tough, coping is all we can manage but if that is what one spends their life doing than no they are not that likely to be an outlier. But wait you say, look at all of the alcoholic writers, stoner musicians, and self medicating highly accomplished professionals? We have seen a sea of articles and interviews attesting to the fact that, no they are not too happy about coping instead of living. How we each manage TEM, (time, energy and meaning) is personal and there are an infinite number of ways to accomplish this. More on this tomorrow.Back to the main point – we have to mange time, energy and meaning. Now I am sure some of you are saying but shouldn’t the M stand for money, not for meaning? Well I hate to break the news to you but Money is not the same thing as Meaning. If you use Money as the context for you time and energy than that is what you will get, money. 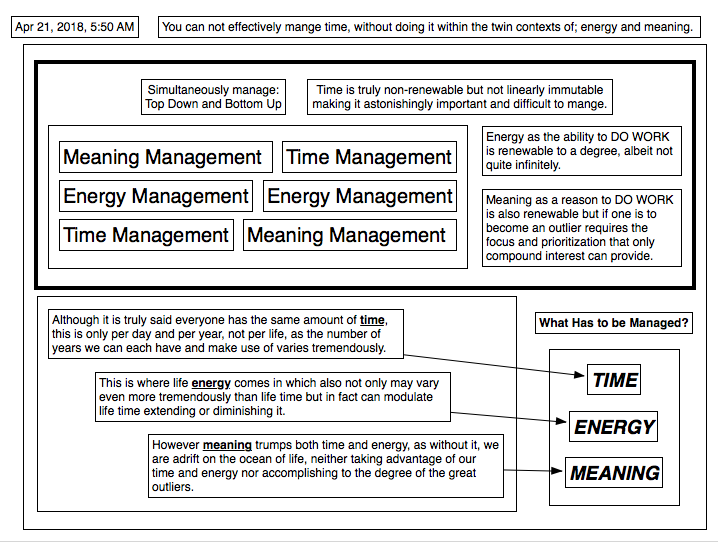 If you use Meaning as the context for time, and energy (for they do need a context) then Meaning is what you are more likely to get. Certainly some outliers are primarily driven by money, or by coping through escape, and I wish both groups well, but I personally would rather hang out with people who are pursuing meaning as a more lasting focal point for a life. Without meaning, who cares about time, drifting from one day to the next. Without meaning do you think you have more or less energy? Now if you have abundant energy and good genes you can live a long time cruising around at high speeds but if there is no meaning to focus and prioritize your efforts you will not likely be very happy or secure. If you know what matters to you, and where you are going, and how to create meaning for yourself, (and yes I very much mean that it is each and every person’s responsibility to create meaning for themselves), well you may end up being a bully or a manipulator of others or yourself neither of which is particularly satisfying nor longevity promoting.The bottom line is it is crucial to find out what matters to you, if your life is to have meaning, and if there is something to mange your time and energy with respect to, or to even bother to get for in the morning. Meaning trumps both time and energy. Even if your time is short and your energy is low, you can radically improve your life by investing it is activities that produce meaning for you. And if you do, you may find that your energy grows and your time expands for life and the universe are quite nonlinear, dimensionally vast and therefore full of opportunities disguised as problems and vice a versa. Manage your meaning, energy and time all together, for if they are not in alignment, their interdependence will surely cause problems which interfere with becoming the outlier you were born to be.